Lloyd Alter, of TreeHugger, posted a great slide show today titled Green Roofs are Changing Architecture and Planning. In 15 slides he gives a great overview of green roofs yesterday and today. Perhaps to everyone’s surprise, [green roofs] have turned into planning tools to help put buildings where no building has gone before, are radically changing the architectural form of buildings, the way architects present buildings and the respective roles of architects and landscape architects. Let’s just be vigilant to ensure that [green roofs] are not misused and brought into disrepute by using them as excuses to put buildings in places they shouldn’t be, just because they are green. I have long been fascinated by “green” roofs. As a child, my sister and I would make forts and I would throw dirt and weeds on the roof. I had plans for a vast subterranean playhouse with a dirt roof (at the time we lived in the desert and didn’t know what green was). 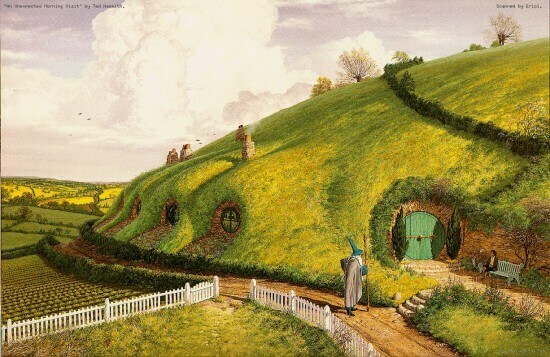 I loved how Tolkin’s hobbits created the shire; where thier homes were burrowed in the dirt. I think I have subconsciously set that as an ideal for some time. I have been a long time proponent of “green” Architecture, not because of an altruistic desire to save the planet, but because I believe that the principles of sustainable and “green” architecture make for buildings and environments that are more comfortable, practical, and usable. A problem I see with a number of “green” proponents is that they feel that unless you are being “green” for the right reasons then you are doing something wrong. Greenwashing is a term that is often used to describe this behavior. What is the “right reason” for having a green roof / roof garden? If someone is doing something that is going to make a more energy efficient, usable building, whether the motivation is to make money or save the planet, isn’t it a good thing? Or is the real complaint that planning commissions are being “tricked” into supporting projects just because they appear to be green? I think the design community needs to support good design, risk taking, and building and construction practices that will enhance our communities. Questioning peoples motives, judgment, or intelligence isn’t helpful. Keep building those green roofs, live roofs, roof gardens, or whatever you feel like calling it.